Ps I’ve been playing the concertinas side by side and I am very surprised at how different they sound ,the rosewood that I thought was warm seems sort of “harsh” but in a really nice throaty way and the action is very positive but requires a little pressure, the ebony raised ends sounds completely different its a mellow and warm sound a bit like its slightly compressed ,very smooth and the action is incredibly light it’s not quite as loud as the rosewood it also has 6 fold bellows opposed to the 5 fold on the rosewood but I can’t see how that wound actually make a difference to the sound or does it? Here's a picture of my brass-reeded Aeola tenor-treble, and my metal-ended tenor-treble. A week and a half ago, courtesy of Greg Jowaisas, I came into possession of this 1870s brass rivet reed Wheatstone. (The picture is one that Greg took for me while it was still on his workbench.) It's proving to be a real dream for song accompaniment. I would think that whilst the Rosewood ends are probably solid rosewood the Ebony ends are ebonised Pearwood, or something like that. 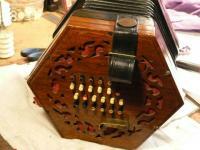 The Rosewood, being a much denser material than the ebonised wood, will give a brighter/ louder tone to the instrument. 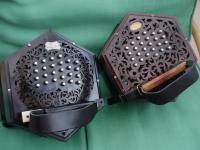 But each concertina, and those from different periods especially, might show individual sound characteristics . But I’ve been having a closer inspection of the ends with a super bright LED light I have in the workshop (eyes aren’t what they used to be LOL) and there are just visible slight dark brown seams? I bought the raised ends one as I really want to learn more about the mechanics/acoustics ETC and I did bid on a couple of ebay fixer uppers and then I tried a Lachenal bone button version but I figured I’ll learn more from a well made quality instrument and I am intending to make one ,so it’s the perfect pattern to have the only problem at the moment is a slight “don’t know how to describe it” flabby short flutter? Just before the low G sounds on the push ? 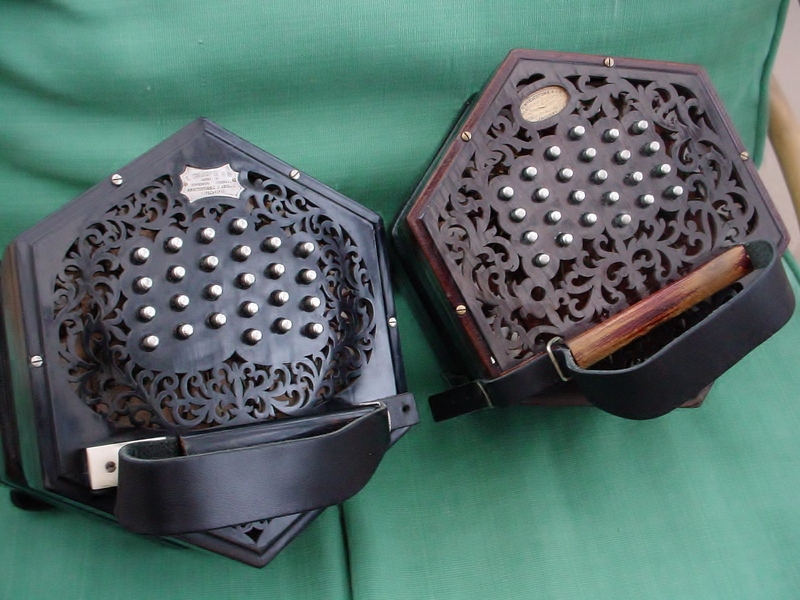 As a way of discussing tone and how the ends affect it I have included here a picture of two MacCann Aeolas which sound quite different. The larger one has ends made of Brittania Metal and the smaller one has the normal Brass/nickel plated ends. There is a slightly softer but almost Bell like quality to the Brittania Metal model. 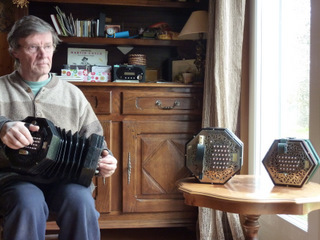 The other picture shows the three Wheatstones that I play; Baritone/treble Aeola EC 1927. 57key MacCann Aeola 1916 and 48key Treble ("The Mean Green Machine") 1898. I have two 46-key Haydens. On the left is my main squeeze, the Wheatstone, SN 60082, built in the mid 1980s, which I bought in 1994. On the right is the Bastari, which my wife bought for me in 1987. 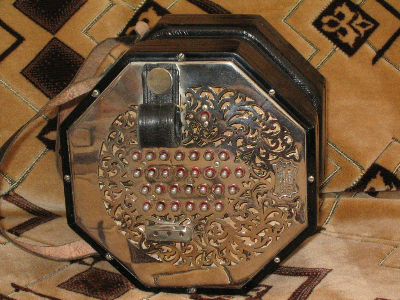 You can see the taping I've had to do on the bellows. I've also had to re-veneer the ends and reinforce the insides of the bellows so they don't blow out. Edited to add: Although the boxes are different sizes, the spacing and slant of the keys and their relationship to the handrest is the same. My lovely new Jeffries. It used to get really boring hearing about people that had picked up a Jeffries in a saleroom for a song, then it happened to me! The old boy that it belonged to took it in with a couple of cardboard boxes of stuff. The auctioneers spotted it and sold it separately but, because it was a cold night in February and there weren't many people there I had a chance. Needless to say, I was very pleased and the old boy was ecstatic, beyond his wildest dreams! Shame I can't play it yet! Hey folks, why just the "pretty" ones? I expect it'll be quite some time before I get this one restored. Still, it is one of mine. I recently asked Paul Schwartz if we could have a permanently pinned thread with the subject "Pictures of your concertina". With the advent of this thread in the last couple of days he has agreed to do so. This means the thread will stay at the top of the thread list along with "Current makes of concertina". A big thanks to Paul for this, if like me you don't see many different concertinas year in and year out then this thread is a wonderful opportunity. There are space issues, but Paul has said he will cross that bridge when he gets to it. 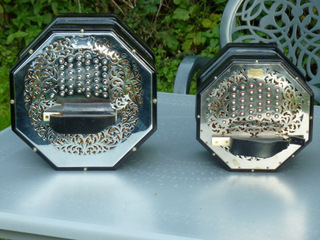 What do contributors think - pretty and restored concertinas, or along with those currently awaiting restoration? I'd like to see both restored and restoration candidates. I suspect that different folks will have different desires of what they want to see or show. Is it just to let others know what we have (bragging rights, perhaps?)? Is it to show how much beauty one can find in different views of concertinas, even in elements not intended as "art"... 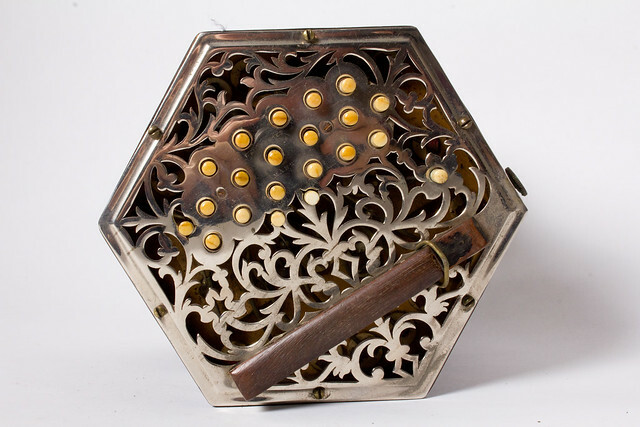 e.g., not just ends and bellows papers, but the beauty-in-function of interior views? An "editor's desk" of submissions for potential inclusion in the concertina coffee table book proposed elsewhere? In a nod to those latter purposes, here are a couple more interior shots... this time of an 81-button (80+air) Aeola Maccann. 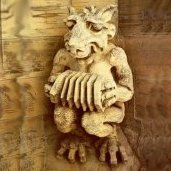 Do you think it should be about concertinas? Do you think it should be about concertinas we own? 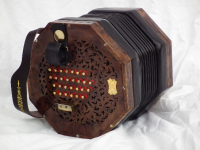 Do you think it should be about concertinas we play? Here is my 1912 56key Aeola [passed to me from Granddad - Danny - in 2004] and one of Granddad's extras - a circa 1896 60key New Model[purchased 2nd hand for £5 sometime in the past, and gifted to another family member who gave up trying to learn it; and so it was the one I started off on] , i.e. a Wheatstone and Lachenal respectively. Same issue here, Kevin...all of your image files are in a private gallery, so they can't be linked to another site. Since Kevin has since fixed the issue, I'm editing my comment to reflect that.